In spite of Jesus’ plea not to be afraid I still get afraid. While I am not really afraid of dying (although I am not looking forward to it) it is living that scares me. That is especially true when my physical ailments are wrecking havoc with me, “God, I don’t know if I can go through this any more.” The ailments are bittersweet, they don’t scare me as much as living with them. There are bittersweet because they have solidified my relationship with God and have permanently burned themselves in my memory so I can recall them to help someone else going through similar circumstances. However, on the other side of that coin is the fact they have fulfilled their purpose (see the previous sentence) so why am I still suffering their effect’s? Fear has many faces. One face is the face of terror, another is a fear of the dark from my childhood I know that face well. Another face is that of nothing changes, things are as they are and will always will be that way is the face I am looking at now. Not only does fear have many faces it also has either a postive or a negative effects on us. And strangely enough fear is also a window where we can look into the foundation upon which or lives are built. Some have said God tests our faith. I’m not so sure about that because life itself is a master at challenging our faith. 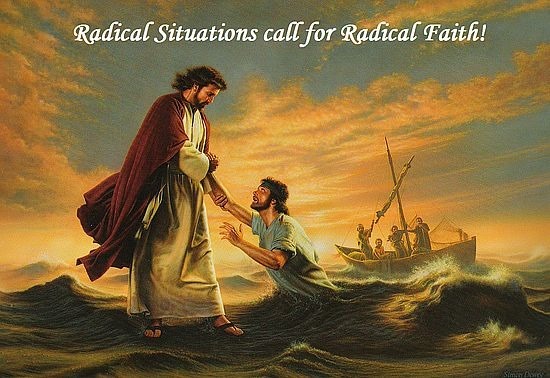 In the challenge and face of fear when the odds are stacked against us we need to completely depend on the Radical Faith we see in the face and extended hands of Jesus. The next time fear begins staring you in the face, close your eyes and with Radical Faith focus on the face of Jesus and take that first radical step and walk with Him.